• FINALLY - A way to export your randomly created groups! 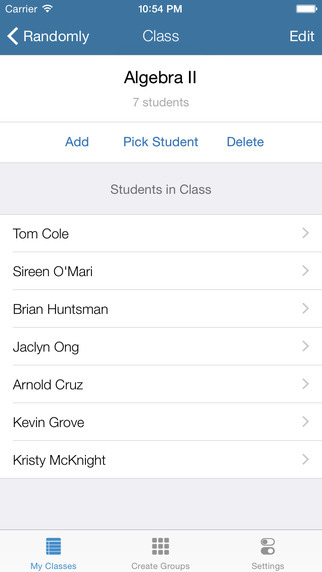 After you have your class broken up into groups, tap the Share button to send a list of all the groups via Email, Messages, or AirDrop to another device! • Minor enhancements to the app's backend. • Support for iPhone 6 and iPhone 6 Plus displays. Randomly is an app made specifically for teachers and professors. It allows educators to enter their students into individual classes. They can then use the Random Name Selector feature to randomly call on a student to answer a question by one of two ways: Truly random, where repeated names are allowed, or a one pass – where all students are called once before they are called again. The device you're using will even call out (vocally) the student's name for you! This app can also be used to randomly generate groups for you. You can split your class into groups by number of groups or by number of students per group. It intelligently knows what to do with any remaining students too! We hope you enjoy using this app for your classroom as much as we enjoyed developing this for you.